Las Vegas hotels, including the Mandarin Oriental and Renaissance, are using automation to cater to customers' needs. Machines are making the drinks. It's a growing trend that could mean big changes for the 300,000 people who work in the city's gaming and hospitality industries. Two-thirds of all jobs in Las Vegas will most likely be automated by 2035. It's not just Vdara that's experimenting with this technology. Other Las Vegas hotels, including the Mandarin Oriental and Renaissance Las Vegas, are using automation to cater to customers' needs. And at bars like the Tipsy Robot, it's the machines that are making the drinks. Left: A man picks up a drink crafted by a robot arm at Tipsy Robot in Las Vegas. Right: People watch robot arms craft drinks as others place their orders on an app. 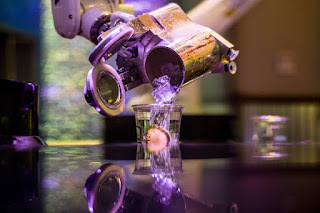 Left: A man picks up a drink crafted by a robot arm at Tipsy Robot in Las Vegas. Right: People watch robot arms craft drinks as others place their orders on an app. "Right now, it feels like we're protected for the next five years," she says. "But in this five years we have to prepare for the next five years, what's going to happen. Nice article.Thank you for sharing this informative article to us.It is one of the best blog that i ever read.Robotics is the latest technology and there are so many innovations associated with this field.All the content posted here are really good and informative.Visit Custom Dissertation Writing Service to get more articles like this.